Planning permission is there to ensure that inappropriate development does not take place. It applies to everything from extensions to residential homes, change of use for business properties right up to new housing, leisure, industrial, commercial, energy and some agricultural developments. If you are renovating or remodelling and plan to change, for example, a garage into an office, move windows and doors or add a single-storey extension of a certain size, you may only need to do this under the auspices of permitted development (we will look at this next month). What is planning permission and why do I need it? 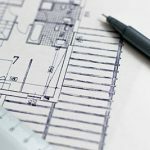 Outline planning permission gives you permission, in principle, to build, for example a house, which is then subject to certain conditions and a need to agree explicit details. An applicant can decide that some matters of detail should be agreed as part of the Outline application and others can be ‘reserved’ for a later date, meaning you can choose whether to ask the Council to approve those relating to Access, Appearance, Landscaping, Layout and Scale as part of the Outline application or not. However, the requirements for gaining Outline permission can still be quite detailed, so developers sometimes choose to go straight for Full planning permission, which will include the exact design and all other details of a development. If you fail to get planning permission and go ahead with your project, whilst not advisable, it may be possible to get retrospective permission, but it is a risky strategy, which could cost you dearly. The retrospective / Section 73A planning application may be refused, and you could be forced to undo any modifications to an existing building or even demolish a new property. Should you change a listed property without planning permission, you are at risk of a criminal prosecution, which could result in a fine – or even a prison sentence. Planning permission is granted by the local authority – the district / borough council, although neighbours, parish and county councils will also be able to have their input on the matter before a decision is made. Should the decision go to appeal, an independent Planning Inspector will make the final decision. If there are no objections and the proposal accords with planning policy, the permission should normally be granted by council officers. If objections are made, the application might be called into a council planning committee for determination. If it does go to a committee the applicant or their agent (a planning consultant such as Apex Planning Consultants for instance), will normally be able to address the committee – dependent on the individual Council you are generally given a maximum of three-five minutes to state your case! Who should be involved in preparing a planning application? Dependent on the location, the scale and type of development, planning policies and the Council’s own requirements, it is possible that several different consultants will be required to prepare and submit your planning application. They could include an architect, highway consultant, flood risk engineer, heritage consultant, ecologist, planning consultant etc. By liaising early with a planning consultant, you can learn who needs to be involved and the cost implications. How long should it take to decide whether to grant permission? Local authorities are supposed to make a decision within 8 to 13 weeks of the planning application and fee being received, dependent on whether it is a minor or major application. The target determination date for a householder application is generally 8 weeks. You will see a notice posted outside or near to the address of the application site with an invitation for neighbours to make any comments / objections / support by a certain deadline. This public consultation period is for a minimum of 21 days, although Councils should still take representations submitted after this time into consideration if the application has yet to be determined. Some statutory consultees include the Highway Authority and Environment Agency will also be notified. Once you are granted permission, it usually lasts for three years – work must be started, but not necessarily completed, within this time. What if planning permission is refused? If your application is refused, you can choose to amend your plans and resubmit, or you can opt to make an appeal to the Planning Inspectorate. How much does applying for planning permission cost? The fee varies depending on what sort of development you are planning – for instance, if you are applying to build a single dwelling, the application fee in England is £462. Scotland, Wales and Northern Ireland have their own fee scales. To apply for an extension will cost you £206. If you ask for pre-application advice from the Council, this is subject to a different scale of fees that are decided by the individual local planning authority. If you are planning on buying a plot of land and building a house, it may well be worth your while, as a planning consultant’s advice could prevent you buying the wrong plot in the wrong place. They can advise you about the likelihood of gaining planning permission for your development and how to go about preparing / submitting the planning application. They can also be especially useful if you live in an area where planning permission is not straightforward – an AONB, for example, or a Conservation Area.